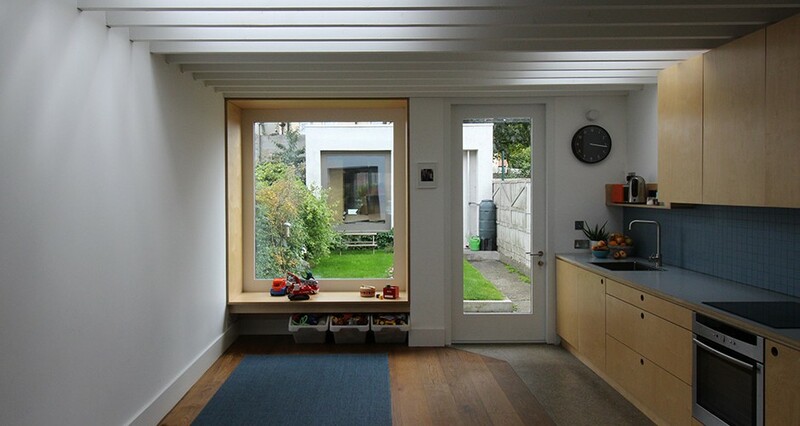 A project to renovate and extend a small terraced house in Dublin. The main challenges were to maximise space and light on a tight site within a limited budget. Opening up the ground floor and building a simple single storey extension to the rear succeeds in providing a light-filled home for a couple with two small boys. A large triple glazed timber window and window seat look out to a small south facing garden. A garden room mirrors the extension and provides much valued additional storage, laundry and workshop facilities. A simple palate of warm natural materials (the alcove of the window seat clad in ply wood nearby the plywood kitchen, warm wide board timber floors, robust polished concrete to the working zone of the kitchen, full bodied porcelain tiles to the entrance hall) contrasts with the light reflecting white painted walls. The exposed joists give texture and interest and an opportunity for subtle lighting to the extension ceiling. We deliver buildings that respond to our clients’ vision, culture and values. We provide a tailored service to suit each individual client's needs, focusing on quality design, careful cost control and efficient time management.